← JAZZ RE:FEST 2015 – THIS SUNDAY! BE THERE! 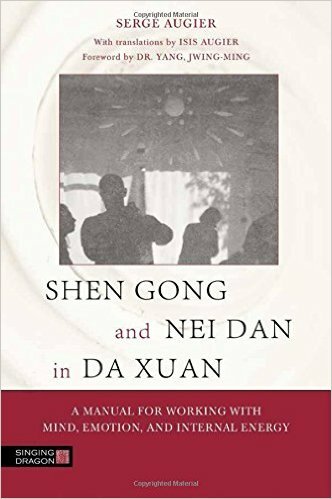 SHEN GONG and NEI DAN in DA XUAN is the first book to be published in English by Paris based “urban daoist”, Serge Augier. This “manual for working with mind, emotion and internal energy” is a genuine opportunity for students of The Way to engage with the essential concepts of the rare Daoist tradition that the author has inherited – Ba Men Da Xuan (the Big Secret). It was on the basis of his reputation that, a few years ago, I signed up to do a weekend workshop with Serge in Gloucester. It was held in a cavernous sweaty gym and attracted practitioners from numerous styles. It was very practical and involved a lot of partner work. Serge would only demonstrate on his own students and I suspect they were the only people in the hall capable of taking the blows and strikes which he delivered with an ease that was totally deceptive. I came away from that workshop with little understanding of what the Da Xuan tradition is but felt exhilarated by the experience of the training. In reality, I was more than a touch dismayed that, despite years of training taijiquan forms (Yang and Chen), there was a serious disconnection. My practical skills were painfully lacking. “Be not fooled by nebulous writings. It should be simple, because this practice has been developed by very practical people. It should be usable and easy to understand. It seemed to provide a way to understand the interconnected nature of the Da Xuan tradition. It was clear from the off that the reader was required to go deeper into himself or herself, and the Shen Gong / pure mind training – demands daily practice accumulative practice which is not easy. Serge readily outlines the principles and exercises in the Shen Gong Training that are to be followed if we are achieve happiness by calming the mind. He then progresses to the Nei Dan – inner alchemy / the way of transformation – aspect of his tradition which focusses on breath and internal energy. He outlines numerous practical breathing techniques and exercises before introducing us to The Eighteeen Methods Leading To The Gates Of Madness – a deepening of the practice where one’s work on the mind is based on three stages: 1. Calming the mind 2. Dissociating 3. Uniting. Yes, it’s deep stuff and though it is rooted in ancient meditation practices it’s also what underpins the modern practice of mindfulness. However, after reading the chapter The Nine Words Of Guidance it was back to Basic Principles and Theory – I needed to learn to walk before I can start running. My initial enthusiastic attempts to follow the manual kept falling by the wayside despite the dire warnings that if you keep taking the kettle off the hear it will never boil. I intuitively felt, “I need to make this journey!” but also felt I needed guidance. I saw from his website that Serge offered distance learning and was seriously considering it when I experienced a most fortunate episode of synchronicity. One day I’d turned up to do some training in my local park and as my regular spot was occupied headed off to an alternative place. Upon arrival there was a guy chatting on his mobile. I just got on with practicing my Chen taiji forms. He finished his call and went through some bagua and xing yi practice. Once he’d finished I immediately introduced myself. It turned out that his name was Darren Rose. He has studied with Serge Augier for 14 years, s a formal disciple and is the Da Xuan school representative in London. Initially, this encounter presented me with a small dilemma. Having read the chapter on Serge in Alex Kozma’s book Warrior Guards The Mountain I knew the martial practice within the Da Xuan tradition unites Ziranmen with the General Li’s taijiquan, Zhang Zao Dong’s bagua and Li Cun Yi’s xing yi. I wasn’t sure how this would work for me. I’m no spring chicken – should I be concentrating on my precarious health or fighting or both. Would I have to abandon what I was already practicing? Or maybe I should just be more disciplined? That said, I am a sucker for synchronicity and, in that sense, there was no option but to ask to join his training group. Darren was openly encouraging of my pursuing both distance learning with Serge and training with him as well. And so, I happily embarked on a new stage of the journey, which is currently focussed on Chapter 13 of the manual and deals with Wai Dan and “how to train the qualities developed through physical training”. For me, martial arts practices are about personal cultivation and by unifying, in a very organised and systematic way, the following five aspects of practice we will deal with the interaction between the Three Treasures of mind, body, and energy. Serge Augier maintains we don’t retreat to the mountain. Through practice we build that mountain in our daily lives. As I said earlier, Serge makes no bones about the need to go deeper into oneself and I sense that this book is going to be well thumbed and a valuable reference, consistently referred to, in the years to come. This entry was posted in Deep stuff and tagged Ba Men Da Xuan, baguazhang, Du Xinwu, inner alchemy, meditation, mindfulness, Nei Dan, Serge Augier, Shen Gong, Singing Dragon, taijiquan, Urban Daoist, Xing Yi, Ziranmen. Bookmark the permalink.